Out of the box the Volca Beats is not velocity sensitive, neither when triggered via MIDI, nor when using the onboard 16-step sequencer. My first idea was to just use automation in my MIDI clips to alter the notes' volume when controlling it out of Ableton Live. Let's take e.g. a simple 8th note closed hihat pattern, where you just want to lower the volume of every other note. You would draw an automation line for CC 44 that looks similar to the following. Note that reducing the CC’s value has to always be done before a note is played. My next idea was to use the Freeware MIDI manipulation software MidiPipe and just translate each notes velocity value to a newly generated CC message. The values of these two types of MIDI messages generally range from 0 to 127, so this should work out without any complicated maths magic. MidiPipe basically works like this: You put togehter an input, a couple of modules and an ouptut. A MIDI messages flows through one module after the other from top to bottom until it reaches an output which in my case would be the MIDI port the Volca is connected to. For more details click the link above to MidiPipe’s homepage. There are quite a lot of types of modules that are able to translate, manipulate or even remove messages but they all didn’t manage to solve my problem. One of the main reasons was the lack of being able to generate a new message according to values I got from another message. # returns 0 for channel 1, 1 for channel 2, etc. Download my MidiPipe config file and if you not already have, MidiPipe. In your DAW you now have to send the output of the MIDI track you use for triggering the Volca to “Midi Pipe Input1”. In MidiPipe set the two “Midi Out” modules to the port your Volca is connected to. So far it doesn’t seem all this introduces latency that delays the drum hits noticeably. I even sometimes use it for live finger drumming. If you find a way to code this all into one script or even solve the message manipulation without AppleScript, just using a combination of MidiPipe’s other modules, please leave a comment, I would love to here! Also MidiPipe is a rather dated piece of software and is not in active development anymore. 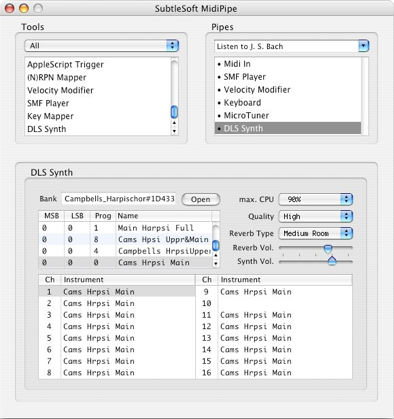 I am as well curious about similar software for MIDI manipulation, preferably released Open Source. Another idea would be to solve this with a nice Max4Live device. Anybody?